I have only about twenty minutes in which to write you a tiny note to tell you how very sorry I am that I didn't write on Sunday and that this is a day late—to tell you too, that I am going to write you a real letter during the week because I wouldn't treat you so badly as only to send you this for a whole week. 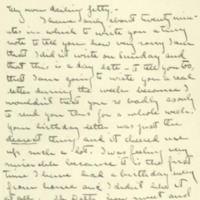 Your birthday letter was just the dearest thing and it cheered me up such a lot. I was feeling very miserable because it is the first time I have had a birthday away from home and I didn't like it at all. Oh Detty, how sweet and dear you are and how I love you. How are you, darling, and how is everything going and has anything happened yet??? Don't work too hard and get all pale and worn out. Just think, October is almost over and then we will have only a little over a month and a half before the Christmas holidays when we will see each other and the darling people at home again. Jetty darling, have you heard what has happened about the trustees yet? I can hardly bear to wait to hear from them and oh, I am so afraid that it is all lost. It happened last Thursday and I haven't heard yet and I feel as if I couldn't bear it any longer. But maybe I will hear to-night and anyway there isn't any use getting wrought up about it for it won't do any good. But I can't help wishing that I hadn't come so far away because the suspense is so awful. Good-bye my own darling, sister, and please excuse this skimpy little note. I love, love love you oh so much. McAdoo, Eleanor Wilson, 1889-1967, “Eleanor Randolph Wilson McAdoo to Jessie Woodrow Wilson Sayre,” 1907 October 22, WWP17408, Jessie Wilson Sayre Correspondence, Woodrow Wilson Presidential Library & Museum, Staunton, Virginia.